In the first five installments of this series, we covered structure, content and channels. Now let’s talk technology…. specifically marketing automation systems (MAS). These new tools, including Marketo, Eloqua, Silverpop and others, are a game changer. Having implemented all three, I can tell you that they go a long way towards making Marketing a science rather than an art. At my current company, we use Marketo for all these things and have effectively created a continuous pipeline from inbound lead though the sales process and beyond. 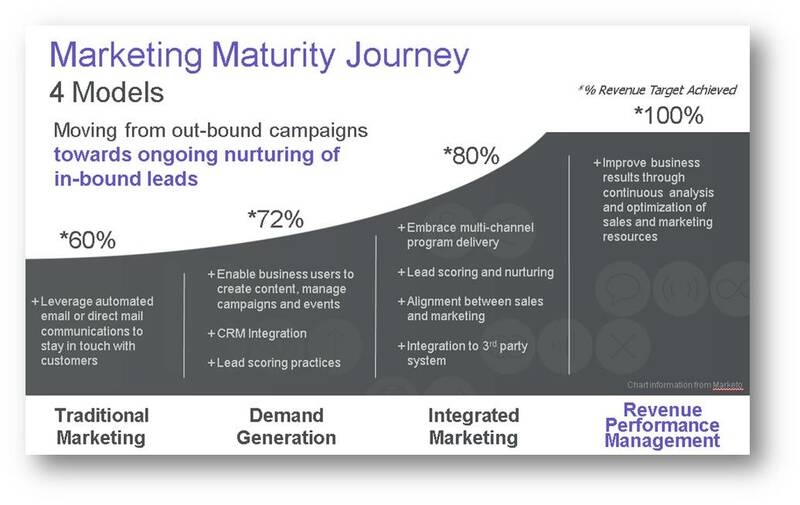 Marketo provided this “marketing maturity journey” slide, which corresponds to our experience pretty well. Like many companies our size, we’ve mostly transitioned out of traditional marketing, have implemented and integrated demand generation systems, and are working daily to integrate sales and marketing efforts. With a MAS, all stages of the funnel are measureable, and management begins to depend on those numbers — and see Marketing’s contribution. Getting to the nirvana of a continuous RPM system is going to take time while all the old dogs learn new tricks. But the journey is as important as the destination. This entry was posted in B2B Marketing, Digital Marketing and tagged B2B Marketing, Digital Marketing. Bookmark the permalink.